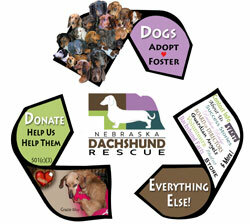 Nebraska Dachshund Rescue is a recognized 501(c)(3)Non-Profit, All-Volunteer Organization. 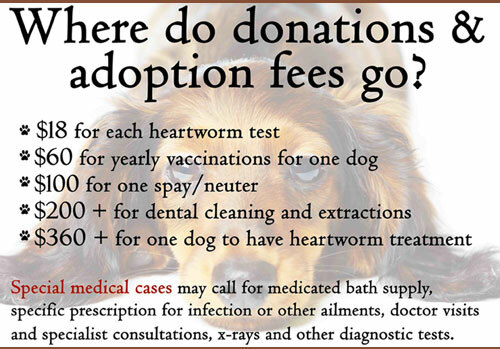 and helping them find loving "forever homes"
Where Else Does Your Donation Go? Vet Bills are our biggest expense. We spend tens of thousands of dollars per year on vet bills. We do not hesitate to have any procedure done that is necessary for the long term quality of life for our dachshunds. This includes expensive back surgery. We purchase custom-made carts from Eddie’s Wheels to ensure the best success at mobility. These are very minimal. We design and print most of our own materials to save money. Board members generously pick up the tab on most of these costs. We have to be insured against potential dog bites and other possible scenarios that an unpredictable, scared dog could cause. We offer them every item they could need to take care of one of our dogs. Most of the events we attend are free; however, some do charge a small fee, but most non-profit groups are discounted. We always weigh the pros & cons and take a board vote before deciding to attend an event that requires a booth fee. We do have an accountant who does our books and an attorney who handles our 501(c)(3), but those costs are donated by one of our board member. Copyright © 2015 - All Rights Reserved. Website Built and Maintained by Elleon, Inc.